The winter has been interesting for me and my new loan pony Muffin, and we’ve achieved lots: we’ve done our first Pony Club sessions, dressage competition and our first BYRDS (British Young Rider Dressage Scheme) camp. They’ve all been fantastic (despite some occasionally miserable weather) and we’re really starting to gel as a partnership now. Muffin found Glamorgan Hunt Pony Club branch activities tremendously exciting as there were lots of new pony friends to be made and no apparent speed limit! Our first dressage competition, just before Christmas, was a bit more sedate and Muffin behaved herself impeccably despite my Christmas jumper and lots of tinsel. We achieved qualifying scores for the Welsh unaffiliated Winter Championships and these will be our first major stay away. The environment will certainly be a test of Muffin’s focus and concentration and should be a good indication of how much we’ve progressed in the time that we’ve been together. I’m really looking forward to it and hope that our winter’s training will pay off. As Muffin is a youngster, the main challenge this winter has been to school her regularly enough so that she learns from repetition. For example, when I started riding her she didn’t fully understand when I was asking her to leg yield, but as soon as she started moving sideways away from my leg I would praise her and then repeat the exercise so that she knew that she was doing it right. I would then do a few minutes of leg yield each time I rode her to help her build strength gradually and be more responsive to the aids. Her lateral work has progressed so much since then and I think it’s a really important exercise as it helps her suppleness too. An interesting exercise that I’ve been doing has been “rider profiling” with my trainer Nina Boex. This involves writing down my short, medium and long term goals along with what I feel are my strengths and areas for improvement (I’m not meant to call them weaknesses!) This has really helped me to analyse my riding as I have to be very specific about what I want to achieve. I have to discipline myself to do it before each schooling session, writing about what I’m going to work on, what exercises will help and what I would like the outcome to be. After the session I reflect on whether I achieved my aims. This is helping me to be more independent as I need to assess myself how things went, think about how to improve them for next time and whether there were any barriers that prevented things from going according to plan and how I managed those. For instance I had planned a relaxation and suppleness session for Muffin, with lots of bending, spirals, serpentines etc to encourage her to stretch down and forwards, only to turn up to the school as people were shooting in a nearby wood! This didn’t make for an especially relaxing ride, but I adapted my goals slightly, we still did the bending and suppleness exercises but I talked and sang loudly throughout the session to drown out the sound of gunshots and we worked on doing some transitions within the pace instead. To help identify my strengths and areas for improvement I’ve had to really think about what I do as a rider and I’ve realised that I’m very determined, fit and that I have realistic expectations but that I need to work on speeding up my reactions when things aren’t going so well. Plus I need to anticipate Muffin’s reactions to things that are out of the ordinary. I also need to be more aware of where I can take risks in a test and where to play things safer. It’s a fascinating activity which I started at camp and it has really helped me to focus. I can’t wait for spring to arrive properly now. The lighter nights are making a massive difference already as I don’t have to rush to ride after school quite so much. 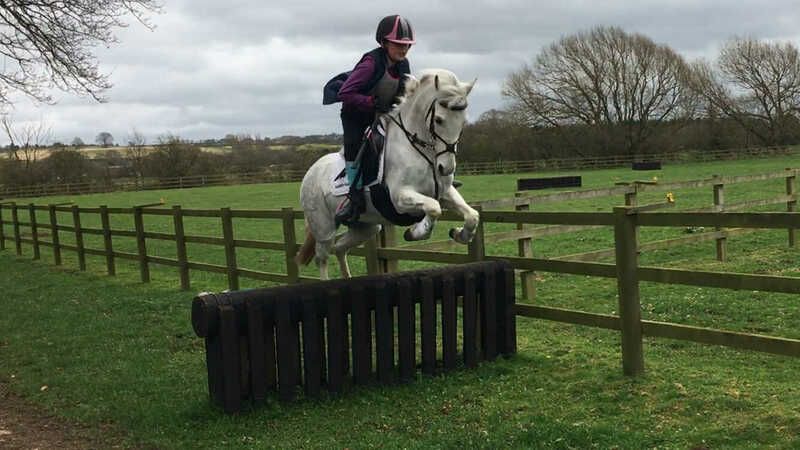 We’ve got lots of exciting and fun things planned with Pony Club – our first go at cross country training, some show jumping training and competitions and of course lots more dressage! I’d really love to have a go at some showing this summer too as Muffin was shown as a four-year-old by her owner and I’d like to work on that aspect of my riding too. I mentioned in a previous blog that I was filmed for a Welsh TV programme about dressage in Wales and we’ve just heard that it’s going to be shown at the end of this month. I’m quite nervous about seeing myself on TV but a bit excited too as it was such a memorable and fantastic experience. There are so many things that I’ve loved wearing this winter, my Higham softshell jodhpurs have been lifesavers in the awful weather and my hi-viz gilet has also been brilliant, but my blue Linton softshell jacket has probably been the best. It’s got a soft, fleecy lining, and is so comfy under a waterproof or hi-viz or on its own. I’ve worn it out running too and it looks cool with absolutely everything.